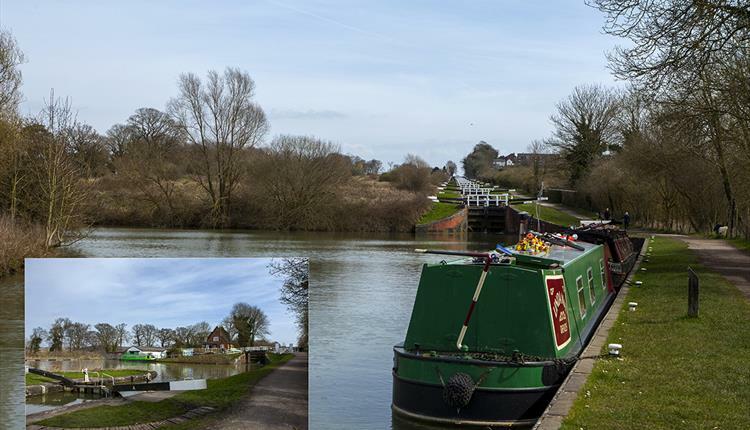 The 29 locks have a rise of 237 feet in 2 miles (72 m in 3.2 km) or a 1 in 44 gradient. The locks come in three groups: the lower seven locks, Foxhangers Wharf Lock to Foxhangers Bridge Lock, are spread over ¾ of a mile (1.2 km); the next sixteen locks form a steep flight in a straight line up the hillside and are designated as a scheduled monument, Because of the steepness of the terrain, the pounds between these locks are very short. As a result, fifteen of them have unusually large sideways-extended pounds, to store the water needed to operate them. A final six locks take the canal into Devizes. The locks take 5–6 hours to traverse in a boat. Meet at Hamworthy Club 9.30 am for coffee, plan to leave 10.30 am to arrive at the George Inn, Longbridge Deverill, Warminster BA12 7DG for lunch at 12.00 noon. After lunch an optional drive up to to view this engineering masterpiece of Caen Locks, then time permitting an optional afternoon tea on the journey home at the Compton Abbas Airfield restaurant.